PEABODY, FRANCIS, mariner, businessman, jp, and judge; b. 9 Nov. 1760 in Boxford, Mass., son of Captain Francis Peabody and Mary Brown; m. first a Miss Perley; m. secondly 1 Sept. 1808 Lydia Brooker, a widow, in Portland (Saint John), N.B. ; there were no children by either marriage; d. 4 July 1841 in Chatham, N.B. Francis Peabody grew up in Maugerville (N.B. ), a settlement his father had helped found in 1762. He was involved as a youth in trade on the Saint John River, possibly in association with the firm of Simonds, Hazen, and White, two of his sisters having married James Simonds* and James White. In 1785 Peabody and Jonathan Leavitt owned a 16-ton schooner and were trading along the coast. Peabody lived in Saint John for a number of years; in the voters list for 1795 he is described as a mariner. One of the places where Peabody traded was the Miramichi River. In 1799 he was given a licence to sell liquor there. According to local tradition, he sailed up the river with a cargo of goods from Halifax and moored his schooner to a large spruce tree, from which Chatham was to derive its first name, The Spruce. At that time there were no more than ten settlers in the immediate area. 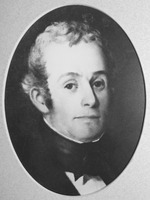 Peabody traded from his ship for salmon, shad, and alewives, which he sold in Halifax. In 1801 he bought a lot at The Spruce from one of the early settlers. Around this property developed a town that Peabody named Chatham. He continued his coastal trading for several years and then in 1804 took up residence at Chatham, where he opened a store. At that time he was in partnership with Jonathan, Daniel, and Francis Leavitt of Saint John. In 1807 Peabody was appointed a justice of the peace and judge of the Inferior Court of Common Pleas for Northumberland County. 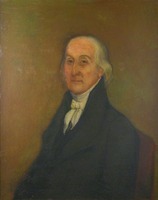 Peabody’s association with the Leavitts came to an end in 1810 and in the same year he entered into a partnership with his nephews Richard and Edward Simonds. In addition to property, their company owned a store in Chatham and a sawmill on the Sabbies River. The mill was sold to one of Peabody’s grand-nephews, Stephen Peabody, in 1823, and at about the same time the partnership was dissolved. Some time before 1820 Peabody had also formed an association with Isaac Paley, a merchant from England who had married one of his nieces. Paley was his partner in the construction of at least one of the five vessels he is known to have built between 1816 and 1829. These vessels registered 1,594 tons and were valued at £15,940. One was destroyed in the Miramichi fire of 1825. The partnership with Paley was dissolved in October 1829 and Peabody then carried on business alone. His shipyard was bought in 1832 by Joseph Russell* and later passed into the hands of Joseph Cunard*. Over the years Peabody acquired a number of stores, including a large stone one built in 1838. 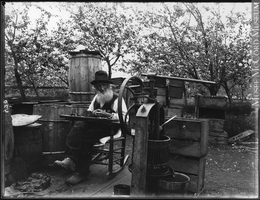 He also owned deal wharfs and timber booms as well as large blocks of property all along the river; he was continually issuing mortgages and through them he acquired much of his land. He was well known for his fair prices and honest treatment of customers. A contributor to the Chatham Gleaner, in a sketch published after Peabody’s death, referred to him as “by far the most extensive and respectable merchant on the banks of the Miramichi.” He was characterized as “cheerful, modest, and unassuming in his disposition . . . simple and unaffected in his manners; simple in his mode of life and altogether free from ostentation and pride.” He was also noted for his hospitality. Henry Bliss*, who braved the almost non-existent roads to reach Chatham from Fredericton in 1819, claimed that one of Peabody’s dinners made amends for all the hardships of the journey. A Presbyterian who contributed to the construction of St Andrew’s Church in Chatham, Peabody also helped build St Paul’s Anglican Church in Bushville. He never entered politics but he was a supporter of Joseph Cunard. N.B. Museum, Peabody family, cb doc. Northumberland Land Registry Office (Newcastle, N.B. ), Registry books (mfm. at PANB). PANB, RG 3, RS538, B5: 38, 48; RG 18, RS153, I71, 1 Sept. 1808. UNBL, MG 3, H11, Henry Bliss to Simcoe Saunders, 22 Nov. 1819. Robert Cooney, A compendious history of the northern part of the province of New Brunswick and of the district of Gaspé, in Lower Canada (Halifax, 1832; repub. Chatham, N.B., 1896), 96. Gleaner (Miramichi [Chatham]), 6 Oct. 1829, 4 Oct. 1836, 3 Aug. 1837, 28 Aug. 1838, 6 July 1841, 17 Nov. 1843. Mercury, 20 June 1826, 2 Oct. 1827. A genealogy of the Peabody family . . . , comp. C. M. Endicott, ed. W. S. Peabody (Boston, 1867). Vital records of Boxford, Massachusetts, to the end of the year 1849 (Topsfield, Mass., 1905). Esther Clark Wright, The Miramichi: a study of the New Brunswick river and of the people who settled along it (Sackville, N.B., 1944), 44–45. J. A. Fraser, By favourable winds: a history of Chatham, New Brunswick ([Chatham], 1975), 19–24. W. R. Godfrey, History of Chatham (Chatham, ), 12–16, 18. Louise Manny, Ships of Miramichi: a history of shipbuilding on the Miramichi River, New Brunswick, Canada, 1773–1919 (Saint John, N.B., 1960), 13–16, 19. J. McG. Baxter, “Francis Peabody, the founder of Chatham,” Miramichi Natural Hist. Assoc., Proc. (Chatham), no.6 (1911): 35–54. W. A. Spray, “PEABODY, FRANCIS,” in Dictionary of Canadian Biography, vol. 7, University of Toronto/Université Laval, 2003–, accessed April 22, 2019, http://www.biographi.ca/en/bio/peabody_francis_7E.html.